Why Can’t I View this CAD Assembly? The next time you ask yourself “Why can’t I view this CAD assembly?”, keep in mind that assembly files, such as the SOLIDWORKS .sldasm, and CATIA’s CATProduct, require parts in order to see anything; otherwise, you simply have an empty assembly. Normally, your customer will send you a folder full of files, with one or more assembly file, and one or more part files. 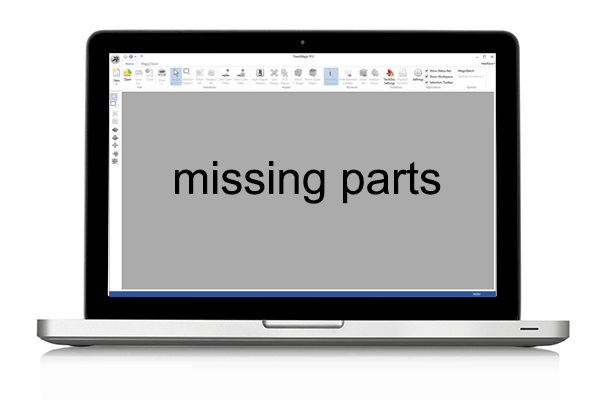 If you don’t have any part files, your assembly will be empty, and nothing will appear on screen. Also note that TransMagic requires all parts to be in the same folder as the assembly file so that it can ‘find’ the part files. If the part files are in other folders, just move them all to one big folder and attempt to open your assembly again. If you do open an assembly in TransMagic R12 or later, you will be shown a “missing file references” dialog box which lists the missing files. Find these missing files, place them in the same folder as the assembly, and try opening the assembly again. One confusing aspect of a *.sldasm file is that it does contain a “visual” representation of the assembly that you can load into eDrawings and other viewers; however, rest assured – none of the CAD geometry is in the *.sldasm file. Keep in mind when viewing a visual representation of an assembly without the part files, you may not be seeing the latest version. If any of the part files have changed, you won’t see that in the visual representation of the assembly; to see the latest version of the assembly, you’ll want to open the assembly in a tool like the native CAD system or TransMagic, with all the parts available. So if you do get an assembly file with no part files, ask your customer to please resend the file with the parts included. For more information about TransMagic, visit www.TransMagic.com. For related articles, visit www.TransMagic.com/blog.